Published on May 20, 2015 in General Interest. 0 Comments Tags: Conferences, Events. Cydcor Conference: Licensed under creative commons. Hosting or attending a conference may not seem worth the time or expense, especially in today’s ever increasing virtual world. Yet while some people might say live events are old-fashioned and out-of-date, they can be a powerful way to promote, conduct and strengthen your business. 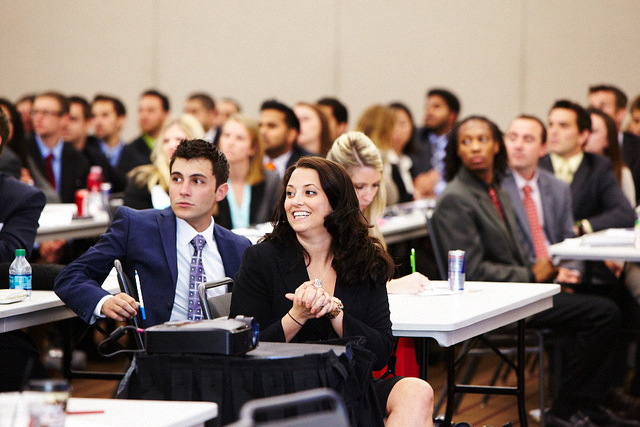 Let’s take a look at three key reasons why conferences can be good for your business. Conferences provide an excellent visual arena for your brand. As a conference host, sponsor or exhibitor, you can achieve phenomenal brand exposure on a diverse array of printed and digital marketing materials such as lanyards, badges, totes and pens. To see what is available and at what price, check out specialist companies such as Signal Events. Of course, branding is much more than just getting your logo out there. This is the where the true value of conferences shines. These events give you the opportunity to engage with people for longer periods of time and on a deeper level than other communication channels, particularly those that are online. In addition to simply exposing your brand, these events allow your business to demonstrate what’s actually behind the logo. This is a great way to launch new brands, build loyalty and strengthen your reputation. The importance and impact that good old fashioned face-to-face interactions can have should never be underestimated. Well organised events can provide a powerful platform to strengthen existing customer and supplier relationships as well as foster new ones. Conferences give you the opportunity to personally connect with customers, suppliers and industry experts. Additionally, one of the primary functions of a conference is to share ideas, which can easily lead to product innovations, opportunities and partnerships. Often, unplanned connections made at conferences prove to be some of the most fruitful. While the Internet is an extremely useful communication tool, it can at times be one dimensional and quite limiting. Nothing can replace the impact of face-to-face interactions and the dynamics that occur when a group of people come together in one place. Conferences are one of the best ways to create a buzz around your products or services, potentially leading to increased sales. They can do this by allowing you to connect with new customers and in some cases, to attract a whole new customer base. They can also provide your business with the opportunity to expand its sales network by building new partnerships, particularly with suppliers. This can significantly expand your sales pipeline as these new connections act as a lead generation and referral network for your business. These events are also an excellent way to launch new products and services, especially when integrated with advertising campaigns. While the Internet has fundamentally changed the way we do business and market ourselves, face-to-face activities such as events and conferences can still be used. They can offer your business a powerful platform to promote and build its brand and reputation, launch new products/services and increase sales. Do you know of any other benefits? What has your experience been like in the past? Share your answers by commenting below.